You have already found many pages in the internet which you need professionally or are for your interest. Unfortunately, you had to notice that some pages aren't offered already any more or you cannot retrieve these any more. You wish that before visited pages are always available and you can access it any time. This makes the WebAssistant possible. Independent of whether currently an internet access is available. You can create e.g. topic specific cache archives to the structuring of your collection. First you create a cache archive for a topic, e.g. your hobby. 1 Click on for opening the dialog Surf Sets in the main menu. 2 Click on Cache Archive now. 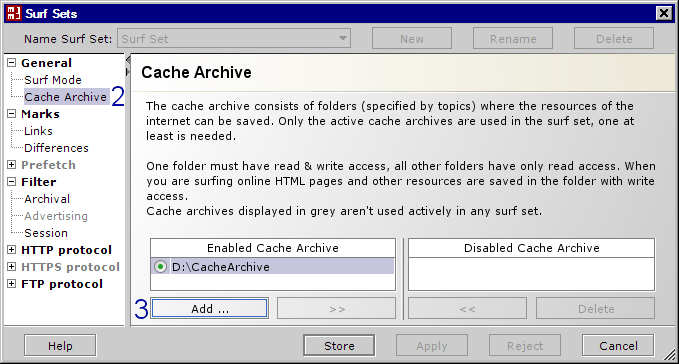 In the following dialog for the file selection you create the folder (cache archive) Hobby. Always choose short path names for cache archives. 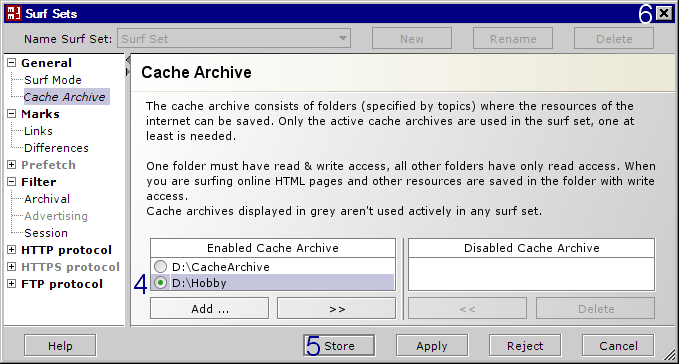 The folder Hobby was added to the enabled cache archives. 4 Click on the check box left to the folder hobby. All files to be archived are then saved into this folder. When you are surfing online the HTML pages and other resources are saved in the folder with write access. All other folders have only read access. 5 Click on Store now. 6 Close the dialog Surf Sets. Make an internet access. Use the configured browser to surf. Delete the cache of the browser. Enter your hobby in a search engine and retrieve some pages from the hit list. Bookmark some pages. You can get the stored pages offline now. You can enter the URL in the browser or call the pages about your bookmark collection. You can create further archives in the same way. You can burn the archives also on a CD. Pay attention to a short path name to the archive. You can manage several archives more simply. We are glad to help you with your installation and use. Please, try first our offline and online test. Describe the appeared problem and inform us about your operating system and browser.